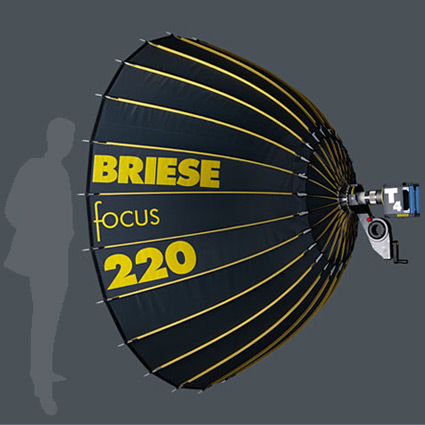 The focus 220 reflector is designed for the professional fashion photographer. Due to the gigantic dimensions of the reflector, the photographer is able to work in front of it without casting his own shadow. This means better control of the lighting situation during the complete shooting session. Fashion photographer’s love this reflector. It brings the sun into the studio and makes other light sources unnecessary. The Focus 220 is compatible with the H2 and H5 (2K and 5K Tungsten) lamp heads, as well as the T4 (1.2K, 2.4K and 4K HMI) and T6 (6K HMI) lamp heads. Available Light includes a Full and 1/4 diffusion with the Focus 220, along with all the other necessary accessories. We also offer an optional 1/2 diffusion, as well as 30 and 50 degree fabric grids.